In 1861 in southwestern Missouri, near its border with Kansas, the city of Osceola was sacked by rabid anti-slavery jayhawkers (from Kansas). When the looting and burning were over, ten people were dead and the city was ruined. Brigadier General James Henry Lane led the 3rd, 4th and 5th Kansas Volunteers- soldiers who were staunchly free soil riding under the name of Jayhawkers. The Kansas volunteers had been charged with the difficult task of breaking the Confederate hold on southwestern Missouri. Outnumbered, in open warfare, the Jayhawkers lost several conflicts, including their defeat in the Battle of Dry Wood Creek. The anti-slavery troops found that less direct tactics were more effective, and General Lane was an advocate of “hard war” methods – where non-military targets, and in particular economic assets, were attacked. 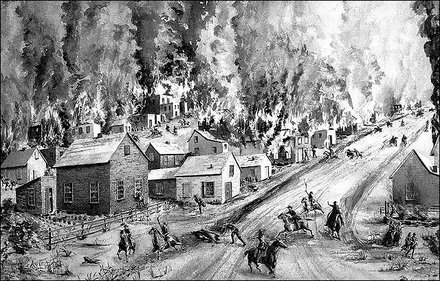 On the morning of September 23, 1861, Lane and his contingent of 2000 Jayhawkers attacked the town. Faced by only 200 Bushwhackers under the command of Missouri Guard Captain John Weidemeyer, the Kansas volunteers had little trouble overpowering them, and the Missourians, who lost one man in the battle, were forced to retreat. Succeeded in capturing a heavy train of supplies destined for the armies of Generals Rains and Price, together with $100,000 in money. Three hundred and fifty horses and mules, four hundred head of Price’s cattle, large droves of sheep and swine . . . 200 slaves . . . 3,000 sacks of flour, 500 pounds of sugar and molasses [and] 50 pounds of coffee. Before leaving, Lane held a mass summary hearing, and then executed nine Osceola residents, bringing the death toll up to ten. Many believe the sacking of Osceola was the primary justification given by the Bushwhackers for their massacre in Lawrence, Kansas two years later. On the morning of August 21, 1863, 400 Missouri soldiers raided the town where General Lane resided, burning the city and killing between 160 and 190 boys and men. General Lane survived the Lawrence Massacre by running and hiding in a cornfield. Approximately 620,000 troops died during the U.S. Civil War (1861-1865) – about 360,000 from the Union and nearly 260,000 from the Confederacy. In direct expenditures, the Civil War cost the Union about $3.2 billion at the time, which, adjusted for inflation, would be $59 billion today (well, 2011). For the Confederacy, direct expenditures are estimated at nearly $2.9 billion in 1860 dollars or nearly $54 billion today. In the aftermath of the Civil War, over 100 national cemeteries were created to bury soldiers who died from the war, as well as veterans who passed away afterward. Virginia, alone, has 18.